Around 1910, the Dunn home at 3800 Main was one of only two homes of this block, which is now lined with commercial spaces and parking lots. That led the Dunns to take advantage of the growing commercial nature of Main – by building business space on to the front of their home. The early mixed-use development was next door to what is now the Unicorn Theater. The Dunn property is now a parking lot. 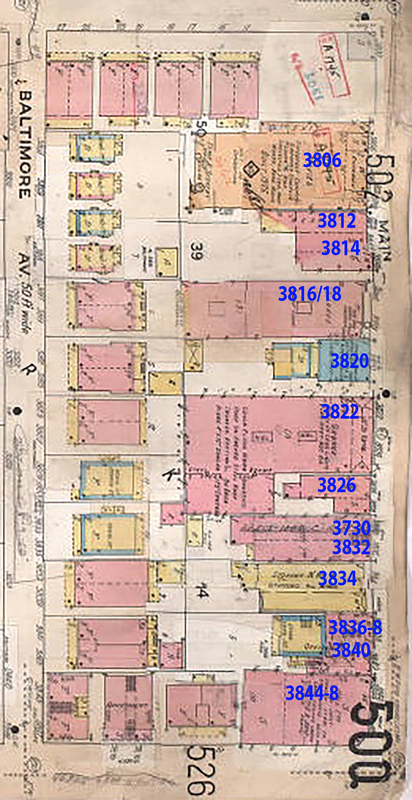 This 1909-1950 Sanborn Fire Insurance map shows the Dunn home at 3820 with the house at the rear of the property and the office space on Main. The Dunn’s home at 3820 Main had stood in the same place since 1909, while new business buildings filled in almost every inch of valuable Main Street real estate. 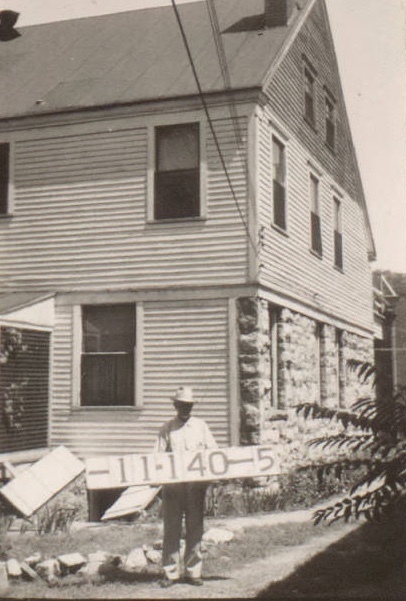 So the Dunns decided to take advantage of their location, and tacked office space onto the front of their home that would allow their property, allowing it to house Dr. E.H. Dunn’s medical practice, daughter Edna Marie Dunn’s School of Fashion, and other businesses until the late 1940s. As part of our Uncovering History Project, the Midtown KC Post is taking a look at the 1940 tax assessment photos of each block in Midtown. (Many people seem confused by the tax assessment photos, which all include a man holding a sign. Here’s the story behind them). This week, we continue to document what is known about the block between 38th and 39th, from Main to Baltimore. More about the southwest corner. The rest of the block will be featured in upcoming posts. Today, Main Street from 38th to 39th. 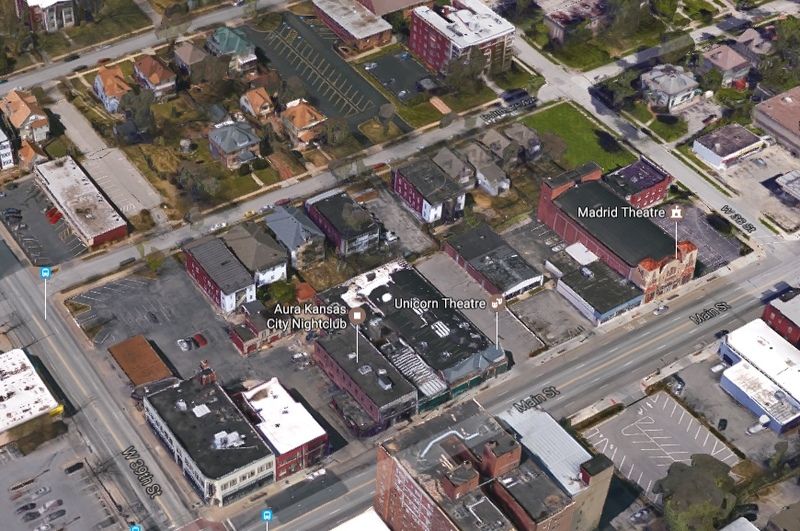 A recent Google map view of the block. Dr. and Mrs. Eli Hamlin Dunn moved into a grey stone house at 3820, Mrs. Bescher’s only neighbors for some time. Daughter Edna Marie would marry real estate man Frank Douglas, who told the family in the early 1930s they could cash in on their location by building business space on the street. They built a storefront with high ceilings and skylights. The Dunn home in 1940. 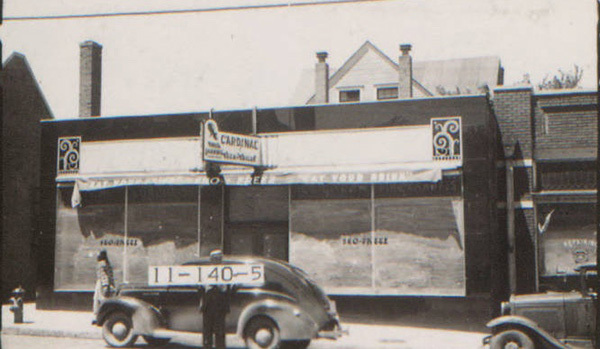 The commercial space in front of the house was used by several businesses between 1937 and 1942, including the Cardinal Grill Fried Chicken Dinner restaurant, as seen in the photo above. Then Edna Marie Dunn moved her School of Fashion to the space. She worked as the fashion illustrator for the Kansas City Star, and taught sewing, pattern designing, and sketching as well as selling gift cards from the space. Her fashion school thrived during the war, which brought clothing shortages and encouraged women to redesign and alter outfits. Women also liked spending the years while their husbands were away learning new sewing skills. The Dunns lived in the home until 1947. 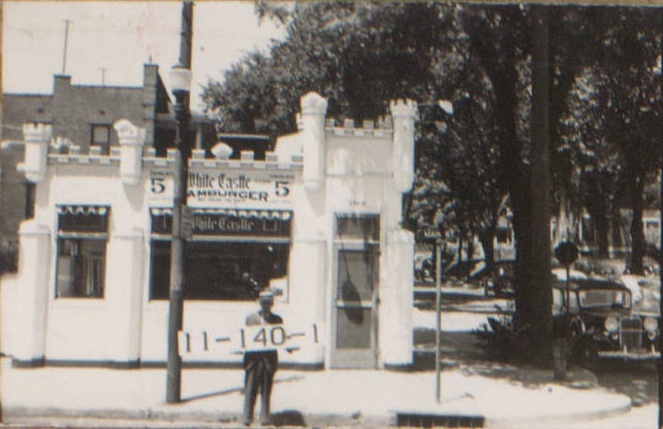 By 1940, the apartment building was gone, replaced by a commercial building that was occupied by White Castle. Later, the building served as a hamburger stand, a drive in and a car dealership. A few lots north of the Dunn home, V.B. and C.K. Beckett build a three-story brick apartment building in about 1904. In 1910, the building known as Gayoso offered renters “seven rooms and bath, strictly modern” for $15 a month. The building was demolished in 1937, with its windows, doors and wood floors sold off from reuse elsewhere. The slideshow below shows the rest of the buildings on Main Street as they looked in 1940. The Madrid Theater with its Spanish architecture at 3810 Main, built in 1926, was one of the South Side’s larger movie houses, accommodating 1200 people. This building at 3812 Main housed a tailor and appliance shop in 1940. It opened as a radio supply store in the 1920s and in the 1940s was a cafe called Mrs. Cook's Dining Room. 3816 Main served as both an auto dealership and a repair garage in the 1930s and 40s. Now the Unicorn Theater, this building was occupied in 1929 by one of the only women to operate a automobile garage, Mrs. Francis Lind. Later it housed a cab company. First an upholstery shop, then a grocery store, 3826 Main may have been best known in the 1930s and 40s as the Green Grill Cafe, specializing in whole fried chicken with all the trimmings. Kathrens Moving and Storage made its home at 3834 Main in 1940. The storefront earlier was a popular waffle shop run by "orchestra and waffle king" Eddie Kuhn in the 1930s. I grew up in Kansas City and while in high school fell in love with the illustrations by Edna Marie Dunn that were loaned to me by my graphic art teacher. He encouraged my interest in fashion illustration and sketching. I was thrilled to get a box of her originals many years later, some dated 1938 — all gorgeous. I am hungry for information about her. Pat, I too grew up in Kansas City and attended Westport High. I think it wonderful that you found a mentor, your graphic arts teacher, who contributed to your appreciation of the arts and in a particular artist that you have come to cherish This is what any good teacher would do, and we all surely know those teachers in our young lives…. I grew up in the 3900 block of Central and 39th and Main was my go to shopping spot. I remember at one time the Toadman cab company had a barn on the west side of Main in the 3800 block. There was a drug store on the southeast corner, I think it was a Rexal. These photos and stories bring back so many memories. Please keep sharing. Rexall Drugs was on Northeast corner and National Shirt Company was on Southeast corner. I appreciate the reminder of the Toedman Cab Co., I had forgotten all about it. There was a Western Auto store on the east side of Main in the 3800 block. I browsed there for bicycle parts.